When Legendary Pictures parted ways with Warner Bros. back in 2013, some of their projects stayed with Warner Bros., like 2014's Godzilla, while others, like this year's Seventh Son, were moved to their new home at Universal Pictures. Legendary announced at their 2014 Comic-Con panel that they are developing both Godzilla 2, set for release in 2018, and Kong: Skull Island, which explores the homeland of the monstrous King Kong. Today we have a report from Deadline, which reveals that Legendary's Thomas Tull is moving Kong: Skull Island back to Warner Bros. from Universal, so it can eventually unite this potential franchise with Godzilla for a Godzilla vs. King Kong movie. 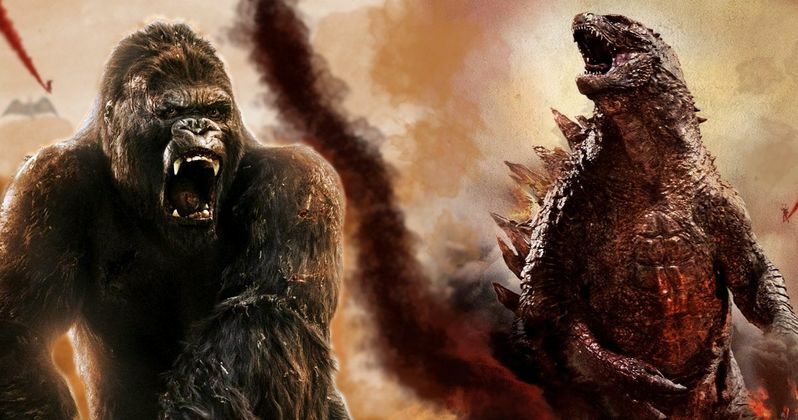 This report claims that, after Godzilla 2 debuts in 2018, Warner Bros. and Legendary will put together a movie that pits Godzilla against the mighty King Kong. The deals are being hammered out very quickly, with the Japanese company Toho, which holds the original Godzilla rights, becoming involved as well. This move was made so both franchises could be housed under one roof, making it more manageable to combine these iconic characters in one movie. Godzilla 2 most likely won't start production until 2017, after director Gareth Edwards releases Rogue One: A Star Wars Story next year. Kong: Skull Island, on the other hand, already has Tom Hiddleston, Brie Larson and Corey Antonio Hawkins set to star, with Samuel L. Jackson and Tom Wilkinson eyeing the roles previously held by J.K. Simmons and Michael Keaton. Production is scheduled to begin either late this year or in early 2016. Jordan Vogt-Roberts is directing Kong: Skull Island from a script by John Gatins (Real Steel), with Gareth Edwards directing Godzilla 2 from a script by Derek Connolly (Jurassic World). It isn't known if any of these filmmakers will collaborate on Godzilla vs. King Kong, or if Warner Bros. plans on bringing new filmmakers in. Legendary and Warner Bros. have not set a release date at this time, but, since Kong: Skull Island arrives in 2017 and Godzilla 2 debuts in 2018, the studio could be eyeing a possible 2019 release. Back in 1963, Toho released the 1963 film King Kong Vs. Godzilla, where both of these monstrous creatures first clashed. It isn't known if this new project will be based on this film, but it could be possible, if Toho is coming on board. What do you think about all of these new details? Are you looking forward to seeing these behemoths battle it out on the big screen? And, if so, who do you think should direct this story?